EDDIE HEARN: This big fight on November 11 is very important in the heavyweight division. Jarrell Miller is making big waves is the US right now and of course in the world rankings and Mariusz who has been, for a long time, they come together and they meet in a pivotal clash on November 11. Both guys are looking for a chance at the world title. While this is not an official eliminator for the world title, one thing is for sure, the winner, I believe, will fight for a world title and the loser will not. This is a huge for both of their careers and is part of a huge show with Danny Jacobs headlining against Luis Arias in a great fight and Cletus Seldin against Roberto Ortiz. DMITRIY SALITA: Jarrell Miller is from Brooklyn, NY and has been moving up the ranks from being an undercard fighter and this is a big stage for him fighting with Danny Jacobs. This is a very serious fight for him and he is in the best shape of his career – the best shape of his life. He understands this is a big opportunity for him and as Eddie mentioned, after this fight he will potentially fight for the world title and be considered as one of the elite heavyweights. Jarrell is following a very rich lineage of Brooklyn heavyweights – Riddick Bowe and Mike Tyson. On November 11 Jarrell Miller will make a name for himself. MARIUSZ WACH: Training is going very good and I am ready. I am very thankful for HBO for giving me this big opportunity and I will not let my people down and I will put on a great show. You are going to see a lot of motion and a lot of bombs. JARRELL MILLER: I can tell you that I am boing to bring excitement back to boxing’s heavyweight division and back in the forefront, especially in America. I am happy to be here on a big card in a big way and I am going to put on a big show for the fans. Mariusz Wach had his chance to do what he had to do and he fell short twice and now he is going up against a big strong guy that comes forward and has the highest punch output in boxing. One thing I can tell you is he signed a contract to fight an opponent that he doesn’t think will come at him. This fight he won’t look any better than he did in his last fight. I am the Big Baby, but I am going to give him the pacifier and put him in the crib. November 11 is my debut on HBO and Eddie Hearn is going to see there is a new player in town, and Big Baby in town, and he’s from Brooklyn. MARIUSZ WACH: That is very good. I hope that you find sparring partners that same as me that you can beat inside the ring in sparring, but they will be different than me. I hope you’re ready when you get inside the ring for this big fight. JARELL MILLER: It’s always easy to find slow, goofy sparring partners to spar with, but there is nothing like a Big Baby – no one throws as many punches and I knock people out. Trust me, I’m not worried about him I am only worried about me. Nobody throws over 90 punches per round, I do. He’s got losses, I don’t, so don’t worry about it, I’ll make it easy on him and get him out quick..
MARUISZ WACH: I can’t wait, I will see you in the ring on November 11. What are your thoughts on the possibility of fighting Anthony Joshua and how do you think that fight would go? JARRELL MILLER: It’s actually a stoke of bad luck on Takem’s part because I feel that Takem is nowhere up to par, that he could do two or three rounds at that. He is too small and doesn’t have enough punching power. He stands kind of straight up but he is the kind of guy that comes forward but I don’t think he has a chance against Anthony Joshua at this point. Like I said before, I was getting ready for a fight and I didn’t get the phone call, but it is what it is and they know what I bring to the table. I don’t know what’s next or who’s next at this point but right now my main focus is on knocking Wach out, whooping his behind then we’ll take it from there. Eddie, what do you think about the possibility of Miller fighting Joshua? EDDIE HEARN: Yes, we require as many contenders as possible. Jarrell Miler is making a lot of noise right now and we look for potential opponents for Anthony Joshua, particularly in the United States and Jarrell Miller is at the top of the list. But on November 11 he has a very tough fight against Mariusz Wach, which is an incredible fight. Coming off a win against someone like Mariusz Wach you can start talking about world title shots. I think Jarrell Miller is one of the true heavyweights and I know Anthony rates Jarrell highly and he’d be out for a fight with Jarrell Miller. He’d be one of the perfect guys to come over and take on in the states. Obviously working with Dmitry and Jarrell there is no reason why an Anthony Joshua/Jarrell Miller fight shouldn’t happen but first he has a very tough fight to get thru on November 11. How are the preparations for the Miller fight? MARUISZ WACH: Camp is going very well – I have been sparring with Derrick Chisora. I plan to come to the US on November 1 and I will finish up camp there. I know it’s going to be a hard fight and I know we will be attacking each other with bombs. There will be a lot of clinching and a lot of going forward – Big Baby has to come in there and fight and box. How do you rate yourself being entertaining both in and out of the ring? JARRELL MILLER: There is nobody more colorful that n in America in boxing right now, especially in the heavyweight division. It is very important you show the fans who you are and what you’re capable of doing, but it’s hard to show who you are unless you have that platform to do it and I definitely feel that HBO is the ones that put their money where their mouth is and they want to come back in a big way to the heavyweight division to find talents and they came to the right guy. I am not out here to prove a point just for myself but I have to put on a show for the fans to show them that American boxing is back and it wasn’t dead it was just taking a nap. With me being the face of it right now is going to be phenomenal and after this fight on November 11, which is going to be another notch in my belt and to let the people know that the heavyweight division is back and Big Baby is here. DMITRY SALITA: Jarrell Miller is born and raised in Brooklyn and has always talked the talk and walked the walk and has always fought the toughest guys available and on November 11 we will see a new star. EDDIE HEARN: 100% – personalities make the sport. Characters make the sport and Jarrell Miller is the Big Baby and he does have a big mouth, he’s got a good heart and he’s an ambassador for the sport as well. You know he doesn’t act like a yolk, he’s intelligent and he likes to entertain and that’s what we need in boxing. When you look at the division right now you need, as many characters as possible and Jarrell Miller, if he can fight and we believe he can and we’ll find out more on November 11. He has the potential to be a big star. I think he is great for the sport of boxing and now he is moving up to the elite level and we will find out if he can walk the walk as well as he talks the talk and this is a perfect fight to show that. Do you feel this will be your toughest fight? JARRELL MILLER: No (laughing) every day life is tough. Getting in the ring and doing what you do is not tough. I think marriage is more tough for sure. The fans can say what they want and the media can say wheat they want, but what I am capable of doing and Wach is just going to be another guy that I am going to crush. Come November 11 everyone is going to know what I’m capable of doing. I am bringing a whole different kind of Big Baby, a whole different kind of animal, a whole different kind of look. I always beat people on Plan A – I don’t even have to go to Plan B but I am going to pull tricks out of the hat so I can show people what a real heavyweight looks like with the skills I have. Nobody moves like me in the heavyweight division. My ring IQ is definitely unbeatable and on November 11 you are going to see a different style of Big Baby and it’s going to be fun. Did you notice anything is his last couple fights that showed you advantages you have? 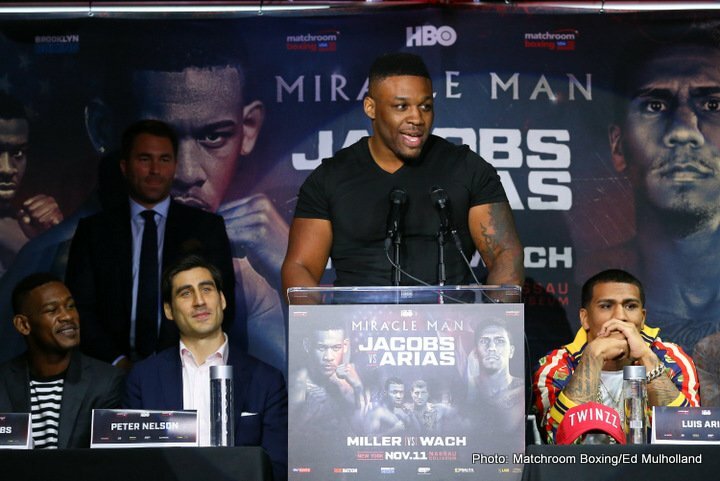 JARRELL MILLER: I loved watching his last fight – it was like reading a bedtime story and by the third-round I was passed out sleeping already so I have ben watching his fights to go to sleep. EDDIE HEARN: There are other heavyweights out there other than Anthony Joshua – there are two other belts as well. Of course there is Deontay Wilder and there is also Joseph Parker and I believe the winner of this fight will be in an eliminator for the IBF so they will get an opportunity to become mandatory challenger to Joshua as well so you just don’t have to rely on a voluntary shot, you can earn your position as mandatory challenger. As far as Jarrell Miller is concerned, I’m sure Dmitriy and the guys know that the more fights the better in terms of developing his profile. He has a great platform here with HBO to go out and showcase his skills to the people watching throughout America. In the build up to the fight and on fight night people will see his personality and his character will be shown through on that platform in front of a big audience. People will be wanting to watch Big Baby Miller again if he puts on a good performance and the pressure is on. He talks the talk and we believe he will deliver on November 11 and if he does on that platform, in a fight like that, I really feel like it puts him in a great position where outside of the champions, he is one of the top guys and that’s the aim of Dmitriy and their team.